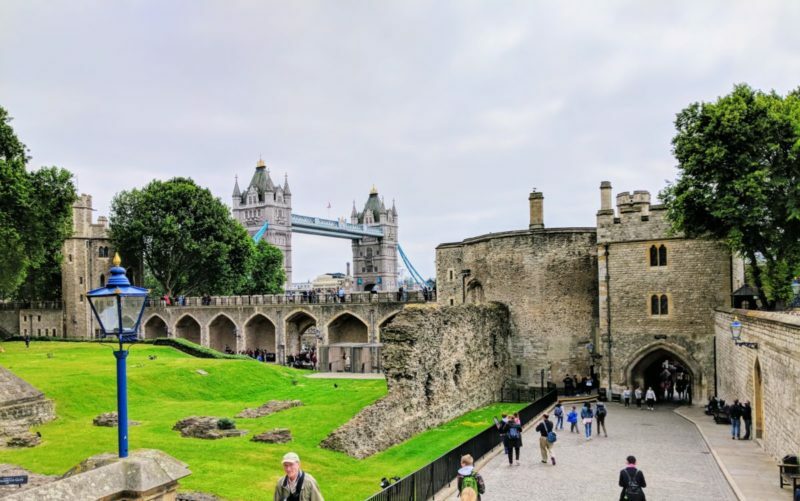 The Tower of London is one of the city’s most popular attractions, and my history-loving family enjoyed it even more than we expected to. Even my 11-year-old son – who usually groans when we plan museum visits – found a lot to like at the Tower of London. The Tower of London isn’t a single building. It has multiple buildings and outdoor spaces, surrounded by a wall that dates back to the Roman Empire. It has been a fortress, a palace, and most famously, a prison. It is located on the Thames, next to the Tower Bridge. There is a lot to do at the Tower of London, but most families won’t need a full day here. Familiarize yourself with the Tower of London’s activities, and then prioritize those your family wants to do most. We spent about 3 hours and hit most of the highlights, but there are still plenty of new things we could see if we get to return. Here are some of the best activities for families at the Tower of London. Find tips for saving money on your Tower of London tickets at the end of this post. The White Tower is the most recognizable building at the Tower of London. It is filled with fascinating, family-friendly exhibits. Two that we most enjoyed were the Line of Kings and Armoury in Action. Line of Kings showcases the armour belonging to kings from William the Conqueror to George II. It’s interesting to see the different styles and details. Armoury in Action is a new exhibit, and I hope that there will be more like it at the Tower of London and other Historic Royal Palaces. This room is filled with high-tech, hands-on activities that give you the idea of what it was like to be a knight hundreds of years ago. All ages are welcome to try their hand. This area was a particular hit with my 11-year-old son other boys his age. No trip to the Tower of London is complete unless you’ve seen the Crown Jewels. They are the real Crown Jewels, and they have been stored and protected at the Tower of London since 1661. On a weekday in early June, it didn’t take us long to go through this gorgeous exhibit, and it’s a must-see. This is a working collection. Several pieces are used for the opening of Parliament each session. The coronation regalia is on display, and will be used at the coronation of the next king. Yeoman Warder tours at the Tower of London are famous. These one-hour tours are led by veteran military officers who have earned the historic Beefeater uniform. They’ll educate and entertain with thrilling stories from the Tower’s history. Tours start every 30 minutes near the main entrance, and are included with your ticket. Tour groups may be large. You can join or leave a tour at any time. We did not intend to take a tour, but my whole family was drawn in by a fascinating story about a grisly beheading that happened at the Tower of London centuries ago. A few minutes later, we left the tour because my kids wanted to see the Torture at the Tower exhibit. Activities like these sum up why my kids (ages 14 and 11) loved visiting the Tower of London. Digital Missions are another high-tech way for families to enjoy the Tower of London. Download the Time Explorers app on your iOS device. Choose from three different interactive adventures where families can meet characters from history, explore the Tower of London, do challenges and earn badges. My family did not try any Digital Missions on our visit, but it’s free and looks like a great way to engage kids in all the history here. Unfortunately, I could not find this app for my Android phone. If you’ve tried Digital Missions, please share your experience in the comments! Don’t buy your tickets at the gate. There are several ways to save on admission to the Tower of London. Buy online – Save 15% on the gate price when you purchase your tickets online in advance at https://www.hrp.org.uk/tower-of-london/visit/tickets-and-prices/. Family Saver – Many families will save money by buying a Family Saver ticket instead of individual tickets. These include up to 3 children. Kids ages 4 and under get in free. Membership – Planning to visit more than one of the Historic Royal Palaces? If you visit more than two in a year, an annual membership will pay for itself. Learn more at https://www.hrp.org.uk/membership/. London Pass – The Tower of London is one of the top attractions on the London Pass. Pay for the number of days you want and visit as many of the included attractions as you like. Arrive any time and skip the ticket booth. We visited the Tower of London using The London Pass. Our Hop-on Hop-off Big Bus Tour (also included in The London Pass) dropped us close to the entrance and we took our passes straight to the entry gate. Click the button to learn more about our experience with The London Pass. My family had a great time at the Tower of London, and we hope yours will too. Happy travels! Where: On the River Thames in central London, next to the iconic Tower Bridge. Tower Hill is the nearest Underground station. Learn more at https://www.hrp.org.uk/tower-of-london/visit/getting-here/. When: The Tower of London is open daily, except December 24-26 and January 1. Hours vary seasonally, but generally go from mid-morning through late afternoon. How Much: An adult ticket at the gate is currently £26.80. There are discounts for children, seniors and students. Kids ages 4 and under get in free. Other discounts are available. Scroll up for details. How Long: 2-4 hours. You could spend a full day doing everything here, but a half day or less will be about right for most families. Oh I really enjoyed my visit to the Tower of London, I’ve gotta get back to London soon!